OKLAHOMA CITY--(BUSINESS WIRE)--What is the main obstacle to getting kids to eat healthier? Research suggests that it might be simply a lack of healthy options. As part of an initiative committed to increasing healthier options for students, Dole Food Company and local grocery retailer Homeland Stores have partnered to donate salad bars to two public schools in Oklahoma City. Working with the district’s nutrition services department, these self-serve produce bars are the first to be implemented by the district, and will feature a wide array of fresh fruits and vegetables to boost nutritious choices for students at breakfast and lunch. Representatives from Dole, Homeland Stores and the United Fresh Start Foundation presented Hawthorne Elementary School in Oklahoma City today with a new salad bar at a dedication ceremony. The salad bars were arranged through a partnership with the United Fresh Start Foundation to support Salad Bars to Schools, a program which has donated salad bars to 5,000 schools over the last six years and is benefiting 3 million children with increased access to fresh produce. The United Fresh Start Foundation works with the produce industry, foundations and allied businesses to support salad bars for schools nationwide, promoting salad bars as the most effective strategy for increasing children’s produce consumption at school. Salad bars are scheduled to be expanded to additional schools in the district later this year, as well. Current USDA nutrition standards for school lunch include a variety of colorful fruits and vegetables each week, and salad bars provide an easy way for schools to serve these options. Research and experience in schools across the country demonstrate that children significantly increase their fruit and vegetable consumption when given a variety of choices in a school salad bar. When offered multiple fruit and vegetable choices, children respond by incorporating greater variety and increasing their overall consumption. HAC, Inc. is a supermarket chain in the United States. Their headquarters is in Oklahoma City, Oklahoma. HAC operates under several banners including Homeland, United Supermarkets, Country Mart in Lawton, Oklahoma, Cash Saver Cost +, Piggly Wiggly, Food World, Beachler’s IGA, and Super Save Stores in Texas. As of 2017, the employee owned regional supermarket chain operates 78 supermarkets in five states; Alabama, Georgia, Kansas, Oklahoma and Texas. For more information, please visit http://www.homelandstores.com/. Oklahoma City Public Schools (OKCPS) is a multi-cultural district serving approximately 46,000 students. OKCPS students are educated throughout 54 neighborhood elementary schools, 16 secondary schools, 2 special centers and 15 charter schools located in a 135.5 square miles in the center of Oklahoma. More information at: http://www.okcps.org/. 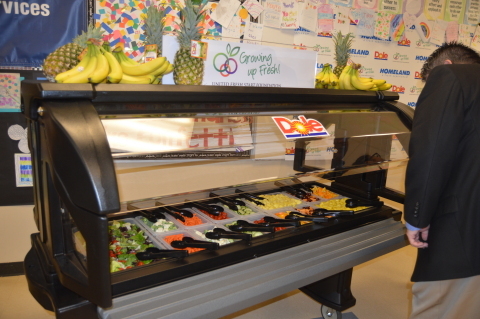 Dole and Homeland Stores have partnered to donate salad bars to two public schools in Oklahoma City, to increase healthier options for students. The first salad bar was unveiled Feb. 2.